肖敏, 王根柱, 戚欣, 李静. eEF2K对MDA-MB-231细胞增殖的影响与初步机制研究[J]. 中国药理学通报, 2018, 34(8): 1061-1065. XIAO Min, WANG Gen-zhu, QI Xin, LI Jing. 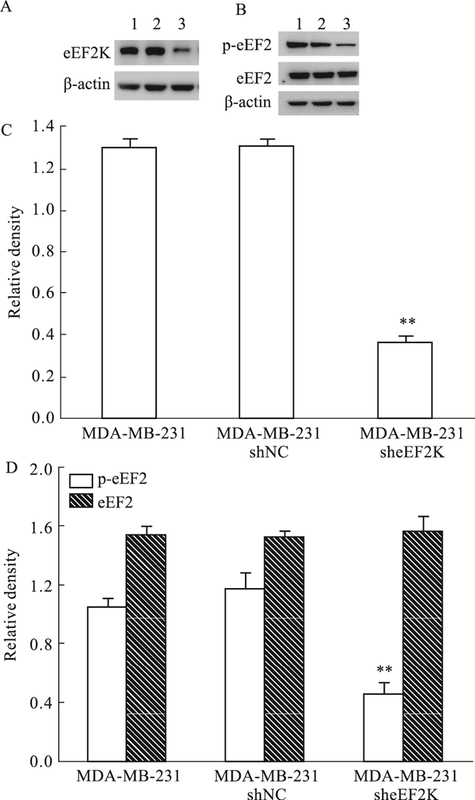 Effect of eEF2K on proliferation of MDA-MB-231 and its preliminary mechanism[J]. Chinese Pharmacological Bulletin, 2018, 34(8): 1061-1065. Abstract: Aim To investigate the effects of eukaryotic elongation factor 2 kinase (eEF2K) on the proliferation of triple negative breast cancer cell MDA-MB-231 under different culture conditions and to explore its preliminary mechanism. Methods The lentiviral was used to construct stably transfected cell lines. The cell proliferation curve was determined by SRB assay. The clonogenic capacity of cells was evaluated by plate clone assay. Moreover, to explore its mechanism, expressions and activities of proteins related to cell proliferation were estimated by Western blot assay. Results In complete medium, eEF2K inhibition of MDA-MB-231 cells promoted cell proliferation and colony formation, and down-regulated the activities of Akt and mTOR, rather than PI3K, Src, ERK and JAK.While in nutrient deprivation, inhibiting eEF2K resulted in promoted cell proliferation. Conclusion In different culture conditions, the expression of eEF2K in MDA-MB-231 has different effects on cell growth, and the role of eEF2K in cancer development remains to be explored. Fig 1 Different MDA-MB-231 cells constructed with lentivirus infection(x±s, n=3) A: MDA-MB-231 cells were infected for 24 h and screened with puromycin for 14 d. Cells were then lysed and samples containing equal amounts of protein were analysed by Western blot using the indicated antibodies; B: The activities of eEF2K in different MDA-MB-231 cells. 1: MDA-MB-231; 2: MDA-MB-231 shNC; 3: MDA-MB-231 sheEF2K. C: Quantitative analysis of (A); D: Quantitative analysis of (B). **P < 0.01 vs MDA-MB-231 shNC. Fig 2 Effect of eEF2K inhibition on cell growth of different MDA-MB-231 cells in different media A, B: Cell proliferation with eEF2K inhibition was measured by SRB in different MDA-MB-231 cells cultured in glucose free medium and serum free medium (n=6); C, D: The activities of eEF2K were measured in wild MDA-MB-231 cells cultured in glucose free medium and serum free medium by Western blot (n=3). *P < 0.05, **P < 0.01 vs MDA-MB-231(Glc+ or Serum+); #P < 0.05, ##P < 0.01 vs MDA-MB-231 shNC (Glc-or Serum-). Fig 3 Effect of eEF2K inhibition on cell growthof different MDA-MB-231 cells A: Cell proliferation with eEF2K inhibition was measured by SRB in different MDA-MB-231 cells cultured in complete medium(n=6); B: Colony formation experiment with eEF2K inhibition in different MDA-MB-231 cells cultured in complete medium. **P < 0.01 vs MDA-MB-231 shNC. Fig 4 Effect of eEF2K inhibition on protein expression and activation of different MDA-MB-231 cells(x±s, n=3) A: Proteins related to PI3K-Akt-mTOR signaling pathway in different MDA-MB-231 cells with eEF2K inhibition; B: Other signaling molecules with eEF2K inhibition in different MDA-MB-231 cells; 1: MDA-MB-231; 2: MDA-MB-231 shNC; 3: MDA-MB-231 sheEF2K. C, D: Quantitative analysis of (A) and (B). *P < 0.05, **P < 0.01 vs MDA-MB-231 shNC. 肖婷, 刘锐, 王明伟. 癌症治疗的新靶点——eEF2K[J]. 生命的化学, 2016, 36(3): 397-403. Xiao T, Liu R, Wang M W. A nover target for cancer therapy-eEF2K[J]. Chem Life, 2016, 36(3): 397-403. Hamurcu Z, Ashour A, Kahraman N, et al. FOXM1 regulates expression of eukaryotic elongation factor 2 kinase and promotes proliferation, invasion and tumorgenesis of human triple negative breast cancer cells[J]. Oncotarget, 2016, 7(13): 16619-35. 王根柱, 戚欣, 李静. 真核延伸因子2激酶与肿瘤[J]. 药学学报, 2015, 50(7): 808-13. Wang G Z, Qi X, Li J. Eukaryotic elongation factor 2 kinase and cancer[J]. Acta Pharm Sin, 2015, 50(7): 808-13. Dutta P, Sabri N, Li J, et al. Role of STAT3 in lung cancer[J]. JAKSTAT, 2015, 3(4): e999503. Siveen K S, Sikka S, Surana R, et al. Targeting the STAT3 signaling pathway in cancer role of synthetic and natural inhibitors[J]. Biochim Biophys Acta, 2014, 1845(2): 136-54. Ouyang Z H, Wang W J, Yan Y G, et al. The PI3K-Akt pathway a critical player in intervertebral disc degeneration[J]. Oncotarget, 2017, 8(34): 57870-81. Chinese Pharmacological Bulletin, 2018, 34(8): 1061-1065.